Mattsson is a name that has become synonymous with melodic progressive metal fused with symphonic, neo-classical and ethnic touches. This direction is continued and taken to a higher level for 'Tango', the fifth album to be released under the Mattsson banner. Led by guitarist/composer Lars Eric Mattsson, 'Tango' sees the collaboration between Mattsson and vocalist Adrienn Antal who first paired up on 2008’s 'Dreamchild' release build upon its predecessors impressive foundations for this overall heavier release. Yet 'Tango' is arguably more accessible for the first time listener with tracks such as 'Believe', 'I’ll Find Another Way' and the title track epitomising this commercial aspect. To add another voice to the album Mattsson has called upon Status Minor vocalist Markku Kuikka who darker style contrasts nicely with Antal’s. 'Tango' is 11 tracks clocking in at close to 73 minutes of some of the heaviest riffs and most complex musical passages to date from Lars, yet within the musical virtuosity there is a common theme of melody with the albums lyrical inspiration coming from everyday life and the state of the world. The song 'The Grand Escape' is e a mini rock-opera of sorts as it holds a complete story with sections that could be split into separate songs. Lars rates this track as "The best piece of music I have recorded, and it’s certainly different from anything I have ever done before in terms of structure”. 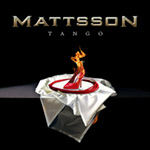 Mattsson also finds time for a little humour in the likes of the title track which takes a metal take on the 'Tango' theme with the final product being an eminently commercial and catchy tune with an almost Abba like feel, whilst this humour again crops up on the smoky blues of 'Slave To The Road'. The initial recording for the album began in June 2009, although 'Slave To The Road' originates from 2003 originally intended to be on the Mattsson album 'Power Games'. Recording of the album continued into January 2010 taking place in 3 different studios in Finland and Hungary before Mattsson set about the final mix and mastering. • Slave to the Road. Lars Eric Mattsson – Guitars, bass, keyboards, sitar, lead and backing vocals on ”The Fire is Burning” and ”The Grand Escape”. Adrienn Antal – Lead and backing vocals on ”Never Stand Down”, ”Believe”, ”Tango”, ”The Grand Escape”, ”I’ll Find Another Way”, ”The Scream of My Soul”, ”Chain Me”. Markku Kuikka – Lead and backing vocals on ”Believe”, ”The Grand Escape”, ”Shadows”, ”Slave to the Road”. Eddie Sledgehammer – Drums and percussion.